While I am focusing on the self-government movement, I do believe that the land right movement is very closely tied to the self-government movement. 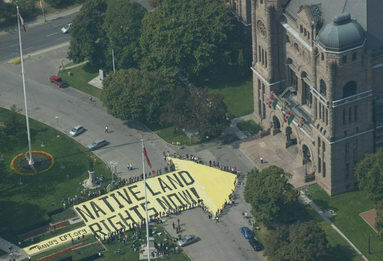 Many of the same groups that protest for self-government also are seen at protests for native land rights as well. First of all, I would like to start by recommending you watch this video by 8th Fire. It was brought to my attention by my T.A and it explains the problems and possible solutions far better than I could ever hope to in such a short time. This video is particularly good because it avoids the 'white man guilt syndrom'; a term I use to define when a piece of work focuses on the idea that all the problems are the fault of the settlers and usually does not focus on what we as a country of Natives and non-Natives should be doing to fix those problems. This video talks about the wide variety of issues that face the Native community today from land claims to education rights from a perspective not often seen in popular media: Native people. Land claims are basically who has the right to chose what can happen to the land. Many treaties and the Indian act have parts that refer to land claims but it is not that simple. Across Canada, there are many of treaties and each is slightly different and sets aside different land for reserves for the Natives. If you recall my second post where I posted this map showing how Native was an umbrella term for the many different cultures that existed here pre-contact. Well have another look and compare it to the second map that shows the treaties and see if you can see a difference. If you noticed that many treaties or land claims cover the area of multiple tribal groups then you noticed the same thing I did. First of all, tribes that lived near each other were not always allies yet settlers would group them all together and divide up the land. If you also take into account the fact that traditionally most native cultures did not believe in ownership of the land and many were nomadic cultures it starts to make sense why today they may feel as though they had been taken advantage of. One side note I would like to focus on for a moment is while reading many online discussions and comments on articles about Native rights, I noticed a large number of people writing things about how Natives lost or were conquered and should therefore assimilate. First of all, there really was never much of a war. Yes, there was conflicts between certain groups and settlers or traders but it was never a declared war against all Native people. If the settlement of Canada could be considered a war in any way, it would have been a war of words, treaties, and promises. Secondly, they were never conquered. Natives of various origins are still alive today along with their stories, lifeways, and traditions even with events such as the residential schools that tried to conquer their culture. And just to give you an idea of just how important this is to so many people look at the photos below that was taken in 2007. This is not an issue that we can just wait and hope it will go away, we; Natives and non-natives alike, have to become more proactive to find a solution to the tension between our peoples. Anti Weyerhaeuser protest, Ottawa, 2007. Next blog will just be a short conclusion as it is the due date for this project.